This exhibition was held at a junior high school under the auspices of Mr. Takashi Murakami. It was the first time I used dust as a material for my work. In one of the classrooms, I spread the dust all over, which I gathered by cleaning the whole three-story school for four hollrs which I asked not to be swept for several days. In my schooldays, the students didn't seem to be on equal terms with the teachers. 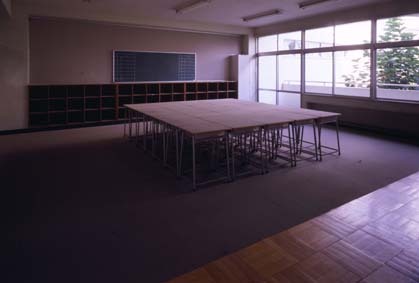 the platform in the classroom. Preparing at the school, I realized how the classroom looked differently from when I was a student. I would never have guessed that I obtained a teacher's license from college. The gap of views between student and teacher made me create this work.